Extract from Affetside by James J. Francis, pages 39-50. The packhorse traffic started to diminish as soon as the turnpike roads were built, all goods being moved more efficiently and less costly by heavy carts drawn by horses. The packhorse trains quickly disappeared, which must have affected Affetside drastically. However, in parallel with this downturn came a steady increase in demand for labour from other areas. Handloom weavers were increasingly required, while as the local works were building up in the valleys, so was the demand for coal and coal miners. Figure 10. Higher Fold Cottages 1981. The demand for handloom weaving grew so big around 1800 that many existing buildings were fitted with looms, while new buildings were erected with loomshops incorporated. Higher Fold is a good local example with its cellar, the entrance to which is off the road, highly suitable as a loomshop. This type of cellar loomshop was popular on the Bolton side, other good local examples being at Riding Gate, Harwood and the cottages on Bradshaw Road, Grimes and Kershaw Buildings. The 1809 Poor Rate Assessments note that new loomshops had just been built at Woods, Croichey and Buckley Close. Handloom weaving continued to employ a high proportion of Affetside folk, both men and women, for the first thirty years of the 19th century. The births registered at St. Annes, Tottington, over this period show registered births of over 130 different families, of which 107 were handloom weavers. Over the same period there were 40 families who registered births, where the breadwinner was a collier. Obviously over thirty years, some families would move from the district, but bearing in mind these figures refer only to the Tottington side, then all the cottages must have been fully occupied if not overcrowded. The coalmines on the Affetside slopes were becoming exhausted and deeper shafts were being sunk, with associated pumping pits to ensure adequate drainage. This movement on the Bradshaw side down the slopes culminated in the New Heyes Pit of Bradshaw Colliery with its pumping pit being on the side of Bradshaw Road opposite Bradshaw Hall Farm. The pumping pit shaft was 156 feet deep. A geological fault running roughly from Bradshaw Hall to Brookfold in Harwood made any further mining impractical. These final shafts were sunk in 1833 but the mine was exhausted and closed by 1845. Bradshaw Colliery was managed by James Seddon and owned/operated by Jethro Scowcroft. Coal mining on the Tottington side followed a similar pattern. Quarlton Colliery operated by Andrew Knowles and Son was working in 1853 but closed soon after, probably due to exhaustion. The underground plans show extensive workings, the earliest dated 1841, with eleven shafts marked. The nearest shaft to the Turnpike Road was named Walves Engine Pit on the hillside facing the Red Lion. The workings extended to the eastern boundary of Quarlton Township and were bounded by Lower Fold and Top o’Quarlton. Apart from an old coal pit near Farnworths the main coal workings at Affetside in the early 1800s were at the other end of Watling Street. Affetside Colliery had a number of shafts in the area bounded by Yeomans, Sheep Hill and Birtles. The main shaft was reported to be 120 feet deep to the Upper Foot Mine. H.M. Inspector of Mines of the time, Mr. Joseph Dickinson, on his geological map of 1865, marked the area from Smithy Fold to Yeomans as ‘got’, meaning that all the available coal was taken and the mine exhausted. Affetside Colliery appeared to be working in 1853, when Jethro Scowcroft was reported as owner, but not in any year following. The area south of Smithy Fold towards Four Lane Ends, had been mined from the late 1700s by the Warburtons, just south of Birtles. A later shaft was sunk about 1800 near the Four Lane Junction, with another shaft in the field towards White Hill. The underground workings plan dated 1854 shows coal mining up to Earnshaws on Bradshaw Road, down to Walshaw Hall and between the Chapel and Whitehill. The Four Lane End shaft was 140 feet down to the coal. The southerly workings with two further shafts were probably connected with the Alderbarrow Colliery, Elton, operated by W.T. Parks Esq. As the years progressed there were more works and factory based occupations detailed in the Parish Records, showing the gradual industrialisation of the valleys on each side of Affetside. The first mention of a Power Loom Weaver in the Register occurs in 1829 marking the beginning of the decline in handloom weaving. Employment from 1850 relied heavily on the various works and factories now well established in the valleys. 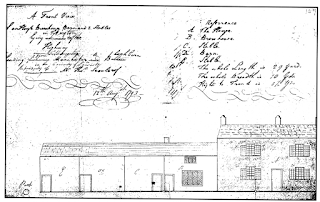 In Bradshaw, Thomas Appleton was operating the Horrobin Mill Bleachworks, while downstream the Hardcastles continued to build up Bradshaw Hall Bleachworks, having bought up the smaller Rigbys, Bridge End and Lea Gate Bleachworks. Up the valley in Turton were two paper mills, the spinning factory at Stone Mill as well as the Querlton Printing Works and bleachers at Black Rock and Know Mill. In the valley on the Tottington side, the Whewells had built up the Two Brooks Bleachworks, while downstream were the cotton mills of Bottoms and Ferns. All these works were within walking distance for the Affetsiders and progressively more and more men and women relied on them for work. The agricultural base of the local economy remained firm and several new trades were being established, such as stonemasons and stonegetting, plasterers and painters, but by the 1870's the main employers for the majority of Affetsiders were the valley industries below. These changes through the century did not seem to affect the well being of Affetside, modest building development continued, and two, at times three, Public Houses were operating - not counting the Bulls Head. The Bulls Head Inn was built in 1801 on the completion of the Turnpike Road on a 999 year lease from John Isherwood to Thomas Scowcroft. It was licensed in 1804 by Ralph Bromiley. There were other associated buildings, including a House and Shop occupied by Thomas Scowcroft, four other cottages and a barn. 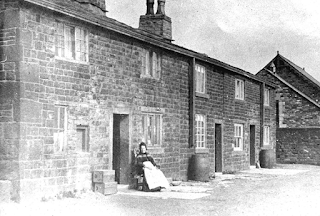 The public house and cottages were rebuilt in 1891 and 1887 respectively, but leaving the old barn on the Affetside side of the road - used for many years this century by the local council before demolition in 1990. Further land was leased for three cottages on 26th March 1845 for 999 years to enable further building on the north side of Watling Street at the junction with the Turnpike Road. The land was leased on 1st June 1871 for three other cottages to be built opposite the three older cottages on the other side of Watling Street. At the junction of Watling Street with the newly turnpiked Turton Road, a Toll House and Bar were erected. These seem to have been demolished when the tolls were abolished. Walves Reservoir was built about 1810 to supply the Quarlton Vale Print Works. Farnworths and Fletchers Farms were sold by the Curacy of Edenfield jointly to John Buchanan, millwright of Ramsbottom, and Thomas Wolstenholme, manager of Ramsbottom. The purchase was by public auction on 7th August 1846 at the Hare and Hounds Inn, Holcombe Brook. At this time there were three additional cottages at Farnworths. The two purchasers later agreed that John Buchanan should have Farnworths and Thomas Wolstenholme, Fletchers. On 24th December 1859 John Buchanan mortgaged Farnworths to Andrew Knowles of Elton, farmer (Height Barn Farm). Andrew Knowles’ family eventually took over the property and sold it to William Bentley of Lee Mill, Bacup, gent, on 20th October 1880 by auction at the Derby Hotel, Bury. Farnworths barn was rebuilt in 1852 when decorative carving was completed round the main arch and some of the door and window lintels. The carving is similar to that on Tottington Jail the same period. The Rev H Dowsett in his booklet ‘Holcombe Long Ago’ details a marble tablet on the west wall of Holcombe Church in memory of the Very Reverend James Wood DD (1760-1839) Master of St. Johns College, Cambridge and Dean of Ely. He was born in this Chapelry, probably at Woods Farm, Birchhey. James Wood would have attended school at the old Court House before going to the Grammar School at Bury. Across on Watling Street, Eccles Wives had a new barn - as noted in the 1809 Poor Rate Assessments, when it was tenanted by Samuel Smith. He remained as tenant up to 1815. Bradshaw Head Farm owned by the Parker family since 1749, was sold in 1830 to Ellis Chantler of Elton, a cotton manufacturer. On his death in 1842 Ellis Chantler bequeathed his Bradshaw property to his sister Mary for her natural life and then to be divided equally between her seven children. Mary Street died in 1861, by which time her family, because of deaths, marriages etc. were left with a complicated apportionment. The family finally went to the High Court of Justice after much disagreement and the Court ruled that the property be sold. The money was to be paid to the Court and apportioned to a complicated formula where four beneficiaries received 5/28ths and the other two 4/28ths of the proceeds. To satisfy this settlement Bradshaw Head was auctioned at Bolton on January 10th 1883 and sold to Andrew Lowe, whose family still own the property today. The Virgins Inn was named on the Honour of Clitheroe Map of 1804 and William Greenhalgh was noted as licensee in 1809, Piggots Directory of 1822 notes James Duxbury which seems to be the last record of the site as an Alehouse or Inn. The site, however, continued to be called Virgins Inn, although from this time reference was to the cottages only. The old Inn building was demolished between 1850 and 1890. The Higher Fold pair of cottages were probably built around 1800 with its cellar entrance to the road, an ideal loomshop. Scowcrofts at Barnwell made no structural changes and may at times have operated as a beer seller. The property known now as Moorside has had a chequered life and on the 1850 map was noted as a ruin - probably through the collapse of the handloom weaving trade. 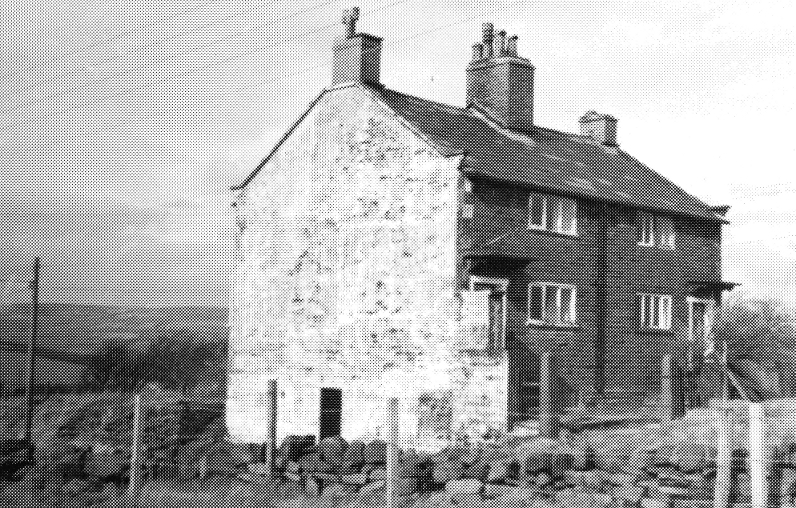 The cottages at the entrance to Scholes Farm were progressively demolished and no evidence was left by 1890. The cottages in the next field along Watling Street had also gone earlier in 1850, but a new building was erected in the next field along. seems to be in the 1887 Bolton Directory when R. Brunskill is noted as a beer seller of the Peel Arms, Affetside. William Scholes is also noted as a beer seller here in 1891 and 1892, to be followed by J. Connolly in 1894 and Hugh Cowburn in 1899. Looking at the buildings towards the Cross, we have Old Hamers which continued to exist as two cottages throughout the century. From 1818 to 1871 the property was owned by James Heywood, Peter and Robert Heywood and Elizabeth Heywood progressively. In 1842 all the previous tythes, payable by the owners of land in Tottington Lower End were commuted into cash values. For this to be done in the necessary detail, a special map was made showing all the fields and properties on a ‘Plan of the Township of Tottington Lower End in the Parish of Bury in the County of Lancaster 1842’ signed by Mr. J. M. Mathews, Assistant Tythe Commissioner. A Schedule was also made giving all the names, descriptions of properties, areas and valuations etc. It confirms most of the detail given on the 1850 Ordnance Map, with important additions like field names. It is on this Tythe Map that the Height Top Farmhouse is designated the Virgins Inn, whereas the currently known Virgins Inn is noted on the Ordnance Survey Map, further down Watling Street. To make the picture more confusing we have fields bordering up to each property, both called Virgins Meadow. The 1794 Survey noted the Height Top property as ‘Affetside Public House’ owned by Ralph Bridge and occupied by Betty Pilling. The 1809 Poor Rate Assessments also refer to ‘Affetside Old Public House’ owned by Ralph Bridge and occupied by Betty Pilling. 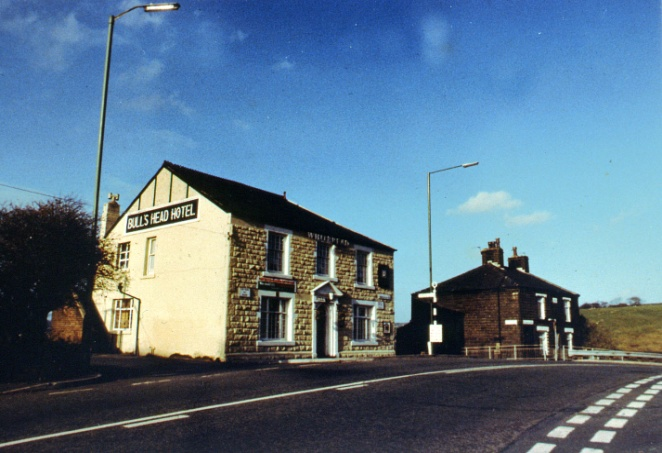 Height Top deeds of 1816 refer to James Pilling as the Innkeeper and in 1840 as the Virgins Inn being owned by John Heap and the Innkeeper being Peter and later John Scholes. The 1842 Tythe Commutation Map denotes it as Virgins Inn. The 1851 Census notes Henry Hamer as Victualer, while the 1859 Poor Rate Assessments notes the ‘Public House - Top o'th Height’ owned by Charles Taylor and occupied by John Ashworth. The same Poor Rate Assessment of 1864 notes it as a Public House with Brewhouse and cellar, owned by Charles Taylor and occupied by Robert Urmston. Top o'th Height or Height Top was purchased in 1866 by James Holt and it seems the public house was discontinued from then on. The Rural Sanitary Rate Book of 1874 notes only land, buildings and two houses. Although the older Virgins Inn had closed by 1830, there seems to be no explanation as to why Height Top took over the name a few years later - another Affetside peculiarity! A deed of 10th April 1816 transferred a part of Woods Uppermost Close from William Barlow and Ralph Bridge to James Pilling of Tottington, Innkeeper. This was ‘bounded on the east by a house and land belonging to Thomas Bentley on the south by the King's Highway and on the west by land belonging to the Minister of Holcombe Chapel, containing on the north 52 yards and 12 ins. on south 53 yards 27 ins. and in breadth 10 yards being 530 square yards’. This was the strip of land along Watling Street on which were built the ‘long row’ of cottages. By this date Thomas Bentley had already built one cottage up to the barns and James Pilling had the right to build other dwellings up to the west gable end of Thomas Bentley’s dwelling. Twelve cottages were progressively built along this strip of land on Watling Street. Piggot’s Directory of 1822 notes Thomas Bentley as a shopkeeper and dealer. Henry Duckworth and his wife, Alice, and kept the Pack Horse until his death in 1805 and hers in 1820. Their daughter Anne (married to Samuel Thweat, innkeeper) and Richmal (married to Charles Taylor, mill warper) continued to own the property until the sale on 2nd July 1868 to John Hutchinson, beerseller. The Indenture of Sale described the property ‘That Inn known by the sign of the Pack Horse.’ A smithy still existed at this time, although it was converted into a stable soon afterwards. Three cottages were detailed, which subsequently became two. The Inn also had its own brewhouse. John Hutchinson sold the Pack Horse in 1875 to Daniel Cunliffe, who in turn sold it to John Butterworth in 1881. It remained in the Butterworth family until 1922. The Pack Horse apart from its own great age, has two other historical connections. The skull of the executioner of the Earl of Derby is on display at the bar. The Earl commanded the Royalist troops on the attack against Bolton during the Civil Wars, culminating in the ‘Massacre of Bolton’. He was finally captured in 1651 and because of his part in the Bolton Massacre, was executed in Bolton. It is reputed that the executioner, a George Whewell, whose family had been attacked by Royalist troops, volunteered as axeman. He is alleged to have lived in the Turton area and there are three possible sites of his home, Whewells Farm in Cadshaw Valley, Whowells Farm in Broadhead Valley and Old Butterworths on the slopes of Turton Heights, which had a datestone of 1667 with initials G:W. This stone was later built into New Butterworths Farm. How the skull of the axeman came to the Pack Horse remains a mystery but it has been here since the late 1800s when the Butterworths became residents. Is this a coincidence or was there some connection with this Butterworth family, New Butterworths Farm and George Whewell? There is also an alleged association with the so-called counterfeiters James and Joseph Bridge. James and Joseph were handloom weavers, born at Withins Farm off Hawkshaw Lane, but at the time of the offence lived at Little Bolton. They were arrested in Rochdale for disposing of forged banknotes, which James said he had received some days earlier in payment for some cloth. Several forged notes were passed, most in Rochdale public houses for ale. They were tried at Lancaster Assizes in February 1805 and James was sentenced to be hung while Joseph was sentenced to transportation for life. Joseph arrived in Australia on 12th July 1806 and was freed after seven years. He later married Elizabeth Buffey, a Lancashire girl also sentenced to seven years for stealing clothing. Joseph and Elizabeth had seven sons and the Bridge family eventually grew to several thousands. There is now a thriving Joseph Bridge Family History Society in Australia, many of whom visit our area and the Packhorse in search of their family history. Being so close to their old home on Hawshaw Lane it is quite likely that the brothers used the Pack Horse as their ‘local’ and they no doubt had relatives amongst the many Bridges in our area. The group of four cottages remained alongside Watling Street at the bottom of what is now the Pack Horse car park, until the early 1900s. Additional cottages were built next to this row. An Indenture dated 1st May 1822 details the 999 year lease of a portion of Smithy Field, by Thomas Lomax, farmer of Mums to Isaac Jackson of Bury, a coal dealer. A cottage had already been built on this piece of land by Isaac Jackson. Eventually Nos. 38, 40 and 42 Watling Street were completed. There was already another cottage between this group of three and the Chapel site. It must be said that at this time a lot of the 300 or so inhabitants were of a rough element, more concerned with sport of a rather rough type than spiritual observance. Drinking must have been rife, with Affetside's beerhouses and the proportion of illegitimate births was alarming - of the 320 births registered at St. Annes, Tottington between 1814 and 1834 thirty-four were registered as bastards. As the district was remote, churchgoing would be minimal and the main religious influence came from travelling non-conformist preachers. The Chapel records report that ‘a travelling Preacher rode on horseback across the wild moorland to take Divine Service in a cottage in the year 1814. Only a few people attended but by the time the Anniversary came around they held their services in a barn, owned by a neighbouring farmer.’ Their continuing efforts must have met with some success because in 1840 they built a Meeting House. The first record of the Conveyance of land for the Chapel was dated 7th October 1835, when Messrs Ashworth and Sons, members of the Society of Friends, gave the plot of land to Trustees for use as a School/Meeting Room. It is recorded that miners and stonemasons of the village quarried the stone locally and they and local carpenters, plasterers and painters gave their services free. The simple Meeting Room was opened in 1840, being a single large room with a small vestry to the rear. The Trustees were Joshua Knowles of Tottington, John Heap of Tottington, Robert Hampson, Richard Walker and Richard Butcher all Bury. The early reports note the week-night attendance was 100 and 50 on Sundays. of ‘The poverty of the people not being furnished with suitable clothing is given as the reason for this remarkable disproportion. Mr. Thomas Hampton preached the Gospel and in other ways looked after the spiritual interests of the people in this barren wilderness.’ Eventually failing in health, Mr. Hampton retired to be succeeded by Mr. John Wilson of Castleton in 1876. The first burial was that of Wright Turner, aged 15 years, on December 11th 1847. John Wilson set out to change the spiritual outlook of the rough element at that time so rampant in the village. No excuse for not attending services would satisfy him; if the mothers said they had to look after their children his reply was ‘bring the children’; and if the men said they had no Sunday suit he would say ‘I am going to preach for the good of your souls, not to a suit of Sunday clothes.’ The outcome was that he filled the Chapel. We do not know where the earlier school was which was noted in the 1794 Survey as owned by Thomas Scowcroft but this could have continued for some time on a fee paying basis. From the 1830s the formation of the non conformist gatherings would have been coupled with Sunday Schools for the youngsters in those days, teaching them to read and write in order to follow the Scriptures. The new Chapel Meeting Room would undoubtedly be used for this purpose on week-nights as well as Sunday afternoons. Figure 27. Chapel Row Nos. 42, 40 and 38 Watling Street, c1920. Ann Scholes who ran a general shop at No. 42. The old cottage between the Chapel Row (42, 40 and 38) and the Chapel which had previously been rented for ten pence per week was unoccupied in 1864 on the death of the owner Betty Whittle. It was demolished soon after to make way for the Chapel extension and yard. The Education Act of 1870 decreed that Elementary Schools be set up in areas where school provision was insufficient. A further Act of 1876 established the principle that all children should receive elementary education. School attendance up to the age of 10 was made compulsory in 1880. It was decided that the chapel building should be used as a Day School and the first appointment of Headmaster given to Mr. John Wilson, who opened the new Day School on June 7th 1879. The Committee or Board was made up of James Nuttall, Absalom Ramsden, James Hamer, Peter Scholes and Thomas Hulme. Mr. Wilson continued with his dual role of preacher and schoolmaster for some years. About 1890 it became clear that the building was inadequate for a multiclass school, so it was decided to build an additional room and to raise the roof level. Money towards these extensions was raised locally through bazaars and collections and debts incurred were cleared by the early 1900s. From the beginning of the Day School it had been customary to clear all the desks aside on Friday night and prepare seating for the Sunday congregation. This was reversed on Sunday night in readiness for the Monday morning school opening. This procedure continues to the present day. At right angles to the Chapel just off Watling Street towards Mums was a group of buildings. These were reduced to two cottages by 1890 and all but disappeared by 1900. They were latterly known as Colliers Row. Higher Nuttalls on the Bradshaw side of Watling Street was tenanted by Widow Greenhalgh in 1806 with John Greenhalgh at Lower Nuttalls. The latter farm was for a short time called Whiteleys, perhaps after a family name or possibly a corruption of Whittles. By 1831, the tenants were Samuel Scowcroft at Higher Nuttalls and James Scholes at Lower Nuttalls. In the 1851 census the Higher Nuttall tenant was then John Smith aged 52 a coal miner, with his wife Ellen aged 50 and son Thomas, a coal miner aged 28, a daughter Rose Miah, aged 19, a cotton factory worker, son Wright aged 15, a coal miner, daughter Mariah, aged 13, a cotton factory worker, and the youngest son Squire, aged 8, a scholar. At Lower Nuttalls, Robert Haslam, aged 31, was the tenant farmer living with his wife Mary aged 32 and daughter Margaret, aged 1. There was at this time an additional cottage at Lower Nuttalls occupied by Thomas Leach aged 30, a cotton weaver, and his wife Ellen aged 26, with son James aged 3, and daughter Ann aged 1. A date of 1824 is carved on a cornerstone of the Lower Nuttalls barn, it is of simple form and possibly carved to mark a domestic event. Swine Trough Farm was built in the early 1800s the only new farm to be formed on the Bolton side since the 1600s. This farm was in Harwood Township about halfway between the Chapel and Top o'th Knotts, with its access from Watling Street through the field opposite the Chapel, sharing the entrance lane with Lower Nuttalls. Swine Trough Farm was owned and occupied by the Lowe family until its demolition just after the 1914/18 War when the land was absorbed into Hoyles Fold Farm, another Lowe property. At Mums the Lomax family continued to own and farm the holding. In 1802 James Lomax settled his mortgage with Ellen, widow of Richard Scolecroft. This surrender mentions new improvements adjoining the King’s Highway probably the pair of cottages up to Watling Street. James Lomax died in 1811 leaving his property to his son Thomas Lomax. 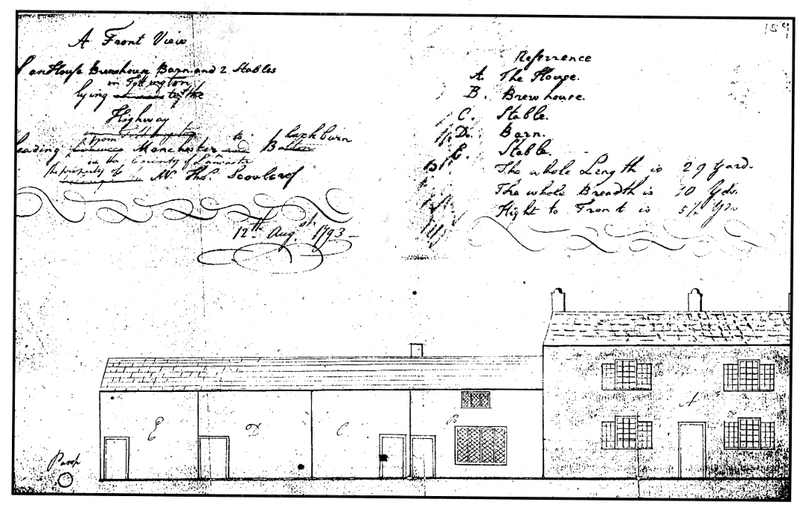 A Mortgage document of 1827 refers to three dwelling houses on part of Smithy Field, these would be the group of cottages at right angles to Watling Street adjacent to the Chapel site. This document also refers to two other dwellings then unoccupied the two cottages between Mums and Watling Street. Thomas Lomax died on January 3rd 1862, leaving his estate jointly to his son James and daughter Mary, wife of Jacob Leach. James and Mary sold Mums to Jethro Scowcroft, Colliery Proprietor of Bradshaw, on October 16th 1867. Jethro died on 17th March 1880 and his widow Margaret sold the farm to John Greenhalgh of Affetside. This sale included the farm, outbuildings with over 11 acres plus the leased land with cottage properties each side of the Chapel. The Victorian frontage of Mums was probably built during the time of Jethro Scowcroft’s ownership. Of the three Bradshaw Estate farms in Tottington in 1815, Lydias (Holts) was occupied by Widow Holt, Yeomans by John Booth and Haworths by Jane Holt while the Hardier Closes were occupied by Samuel Entwistle. By 1831, Holts with 24 acres was occupied by Thomas Rothwell, Yeomans with 122 acres by John Horrocks, and Haworths with 27 acres by James Holt. By 1890 Holts farmhouse and buildings had been demolished and the land incorporated into Yeomans Farm. An Indenture of 3rd April 1854 for a 21 year lease of Holts and Yeomans Farms from Thomas Bradshaw Isherwood to Thomas Scowcroft, Coal Proprietor of Bradshaw, gives interesting details of lease conditions for farms in those days. All the buildings had to be maintained in a good order. All tilled land should lay fallow for at least one year in four. He should not take two crops of corn without intervention of a summer’s fallow. He could grow turnips or other green crops providing the same were eaten on the land by sheep or cattle. No ancient pasture or meadow should be ploughed up without the landowner’s approval. All hay and straw produced on the farm should be con­sumed on the farm. All dung made on the farm should be spread back on the farm’s land. No trees should be lopped or felled. These lease conditions ensured that the property and land were, maintained in a good condition for future farmers and of course maintaining the value to the land owner. The Scowcroft lease of these farms and ownership of Mums may have been to secure the mineral rights for their Affetside Colliery. The Warburton family continued to own the Birtles estate through the century and maintained their blacksmith's shop. The blacksmith’s would have been in the Smiths Fold group of cottages which had progressively been built almost down to Watling Street. The last building of the row remained a stable/barn (possibly the old smithy) up to its conversion into a habitation in the 1980’s. The big change came with the building of Redman Gate Cottage, which started life as a smithy. The Harwood Moor was enclosed in 1797 and the award plan shows that a field of nearly four acres up to the junction of Watling Street and the new Tottington Road was awarded to Mathew Fletcher through his ownership of Height Farm and Hey Head. In May 1830, the Height Farm estate was purchased from Mathew Fletcher Jnr. by William Hall, Quilting Manufacturer of Walmesley, Bury. Soon after William Hall sold the small plot at the junction to John Warburton of Hey Head, Harwood for £15, who built a new Smithy known as Redman Gate. By the late 1880s Earnshaws Farm, alongside Bradshaw Road from Four Lane Ends had been demolished and the land incorporated into the Cross Tenement holding, which by this time had been renamed Isherwoods Farm. It is interesting to get a glimpse of Affetside life from the 1851 Census information given on a few of the properties on the Bradshaw side of Watling Street. Under ‘Baxter House’, the head of the family was James Ramsden aged 77 whose occupation was ‘Brow man over Colliery’. Baxters was a small farm and supplementary work was essential even at his age. His daughter, Sarah, and husband, William Holt, also lived here with their family. William Holt was a coal miner, their son James aged 11 was a coal mine waggoner, and there were three daughters, Betty aged 6, Mary aged 3 and Ann 7 months. William Holt’s mother aged 73 also lived with them. Baxters was at this time a small farmhouse with a cottage attached, with at most a total of four bedrooms! 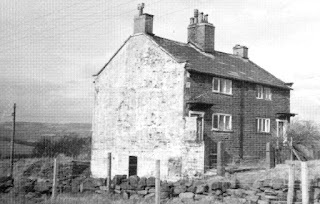 In one of the Scholes Cottages there lived James Hamer aged 33, who was a house painter, with his wife Betty also 33. Their two eldest children Ann Jane aged 11 and John aged 9 were piecers at a cotton mill. There were also four other children, Thomas aged 7, James aged 4, Daniel aged 2 and Alice of 5 months. The nearest cotton mills at this time would have been at Bottoms, Fern Mill or Tottington, some two miles walk away! At ‘Neds House’, John Hamer aged 70 was the farmer living with his wife Alice, also aged 70. Their son John aged 24 lived at home and worked as a coal miner. John Hamer's daughter Helen, aged 33, also lived here with her husband John Walker, aged 28, who was also a coal miner. Neds at this time had two bedrooms, two rooms downstairs and a single storey leanto at the rear. By 1851 handloom weaving had almost ceased, but textile factories and bleach works were growing rapidly. Affetside Collieries were soon to close but the Harwood pits were still operating. Affetside Cross has always prompted speculation as to its history and around 1890, when it was in poor condition, it was pulled down one night in the vain expectation of finding treasure beneath. Mr. Thomas Hardcastle of Bradshaw Hall, who was interested in archaeology, and Mr. Isherwood, Lord of the Manor, joined in re-erecting the Cross, which involved the replacing two blocks of stone at its base and the use of iron clamps. Towards the end of the 1800s the local administration changed radically, although it hardly affected Affetside. The Township of Bradshaw was absorbed into the new Turton Urban District in 1898, having previously been part of Bolton Rural District, which was abolished, and the Township of Tottington Lower End became part of the new Tottington Urban District in 1899. The difficulties of straddling the border between the two new Districts were little different to those of the past, although Turton did eventually improve and maintain the surface of Watling Street with rolled granite chippings.